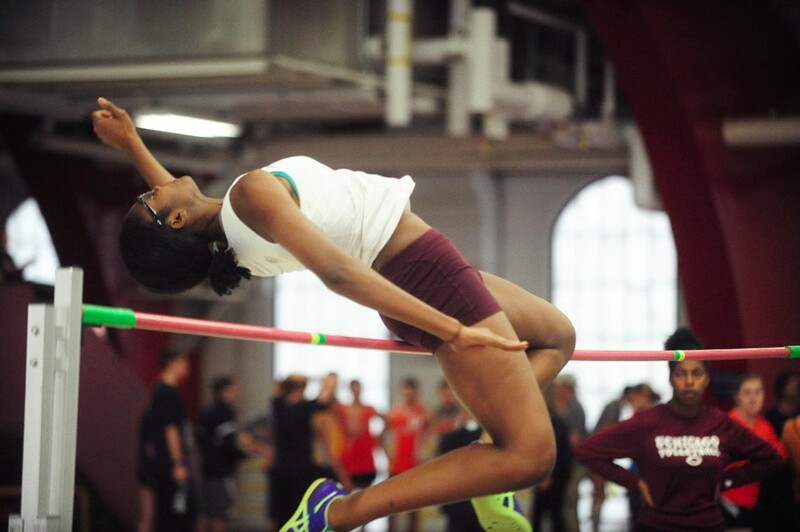 This past weekend the Maroons traveled to New York to participate in the two-day UAA Championships at the prestigious Fort Washington Avenue Armory. By Sunday’s end, the women had secured a second-place finish while the men took fourth. Despite their disappointment at not winning the meet, there were quite a few highlights for the Chicago athletes. The first day of the meet was predominately preliminary rounds for the finals races that would take place the next day, but finals were completed for the five-kilometer race and the distance medley relay. Second-year Khia Kurtenbach captured the first Maroon victory of the meet with her extraordinary 17:07.64 time in the 5k race. After a timing adjustment because the track at the Armory is banked, Kurtenbach’s time ranked fifth overall in DIII this year. Immediately afterward, third-year Gareth Jones took the top spot in the same race with a 14:47.89. The next race was the distance medley relay. The Chicago team of second-year Cassidy McPherson (1200m), fourth-year Mikaela Hammel (400m), third-year Michelle Dobbs (800m), and fourth-year Brianna Hickey (1600m) approached the race with the goal of qualifying for the national meet. They may have pulled it off, as they won the meet in exciting fashion, besting the previous meet record by a large margin with a time of 11:52.28—the seventh best time nationally this year. In Saturday’s field events, the Maroons also had several podium finishes. Fourth-year Nkemdilim Nwaokolo (14.63m) and third-year Andrew Maneval (15.11m) placed second and third respectively in the weight throw. Second-year Vivian Barclay (5.12m) and fourth-year Rachael Jackson (5.06m) took third and fourth, respectively, in the long jump, and second-year Angel Fluet (3.27m) finished fourth in the pole vault. The second day of the meet started early with the women’s shot put, and the Maroons got off to a good start. Nwaokolo (12.19m) earned first place, and second-year Ade Ayoola (11.45m) got third, capturing a total of 16 points for the team. Third-year Joey Gary finished in third place in the triple jump. The men also dominated the pole vault, with fourth-year Michael Bennett winning his fourth consecutive UAA title with a 4.76m vault and second-year Nathan Downey taking third at 4.66m. The races began with the mile, where Hickey ran her second in as many days, and despite the wear and tear still came in second with 5:11.59. Second-year Megan Verner-Crist followed just behind her in fourth place with 5:14.28. On the men’s side, third-year Nicholas Nielsen took third place in just 4:15.41 minutes, and second-year Patrick LeFevre captured his first UAA championship with an 8.35 second 60-meter hurdles race. Running in her third 800-meter race of the meet, Dobbs destroyed the competition, finishing in just 2:10.99 minutes, winning by over a second, and laying claim to the fifth best time in the nation. Not to be outdone with consecutive day victories, Kurtenbach returned for the three-kilometer race and laid claim to yet another victory, while fellow Maroon, third-year Minnie Horvath, took fourth place. “The 5k, 3k double was definitely challenging,” Kurtenbach said. “I tried to ride the excitement and momentum from my first race into day two of the meet.” Ultimately, Kurtenbach credited her team’s support for carrying her through when she was physically drained. “My teammates’ energy and cheers helped push me to give just a little more effort when I was struggling in the second race,” she said. Overall, the Maroons had a slew of great performances that were very exciting for the entire team. They are all very excited to watch and cheer on from home their teammates who qualify for the national meet and to compete in outdoor season this spring.